​We've been Preserving, Protecting, and Promoting Cobb County's historic structures and cultural heritage for over 40 years. A private nonprofit corporation, Cobb Landmarks & Historical Society, Inc. relies on the financial support of our community and neighbors. ﻿Join us﻿ as we work to enhance Cobb's quality of life, economy, and tourism by preserving and sharing our local heritage. Visit the Root House Museum and pay whatever you feel comfortable paying for admission (or nothing at all). Cobb Landmarks is embarking on a $685,000 capital expansion project that will bring a historic Cobb County log cabin and brick smokehouse to the William Root House campus in Marietta. The project will also add exhibit space, meeting and lecture space, a research library, visitor restrooms and executive offices. Operated by Cobb Landmarks, the William Root House Museum offers an accurate portrayal of middle-class life in Marietta during the 1860s. It is the oldest wood-frame structure in downtown Marietta and hosts thousands of students and visitors each year. Plan your visit. 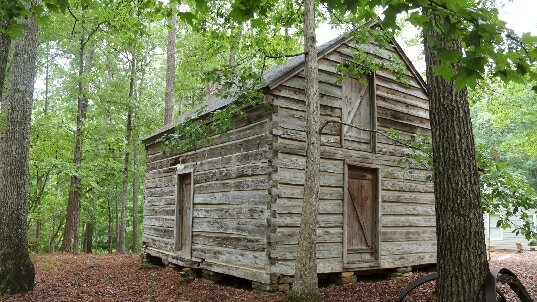 Located on a hillside above the Chattahoochee River, this cabin is believed to have been built by George Abner Power about 1843. Donated to Cobb Landmarks by the Trust for Public Land, it is one of the county’s few remaining log cabins. The cabin is not yet open to the public. Originally located on Macland Road, this cabin was occupied by members of the Manning family during the Civil War. The Manning family generously donated the cabin to Cobb Landmarks in 2016. The cabin is being relocated and preserved at the William Root House site. Support the preservation of this cabin.